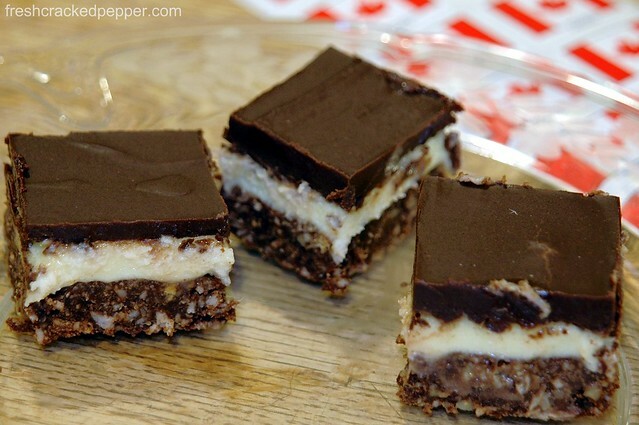 This week I was privileged to share the story of one of Canada’s best-loved sweets, the Nanaimo Bar, over on the Atlantic’s Food website. For those of you who are saying “What? The Atlantic covers food?” —don’t be hasty, and get over there to check it out. I first discovered the site through a search for tempeh. When it comes to the web, you never know what you’re going to get. The story lives over there, but I wanted to give my devoted readers here a preview. I grew up eating these little treats off Christmas cookie platters, only to rediscover them while volunteering in Africa (through some compatriots) and then again while cycle-touring around Vancouver Island, where the recipe was invented. I stayed up late making them last Tuesday night. The next day, I carted the heavy Pyrex (this year’s Valentine’s Day gift that I so love!) downtown to share with my co-workers. They were hit … unless people were just trying to make me feel better for my country having lost to theirs in hockey. Sympathy accepted. I was happy to share the history, my story, and the recipe over at the Atlantic, so check it on out. And if you’re feeling creative, check out this site for peanut butter, mint, and cappuccino versions. 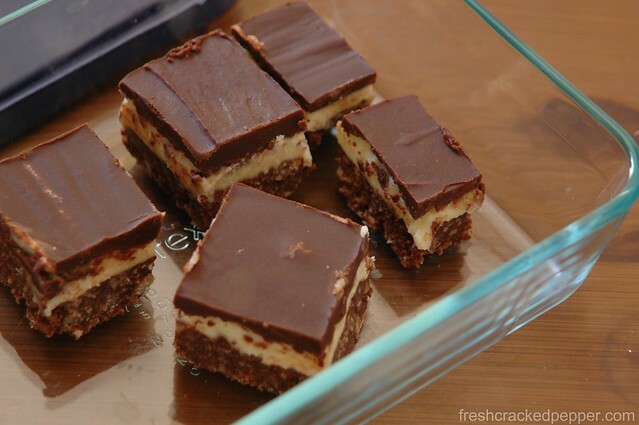 Christmas, and the Wanasing cottage are two times and places where I associate Nanaimo Bars with relaxed family times. Thanks for stirring the memories, Jen! Go Canada go in tomorrow’a game!! Okay, Jen, I’m bound a determined to make this a mildly sweet thing. I understand it’s known for it’s “over-the-top sweetness”, but the experiment of creativity begins tomorrow with my two sous chef daughters. It sounds too good to leave behind. I’ll post on my blog and send you a link. Wish me luck!